Climbed on skis in April 12. 1971, April 12. 1995, March 26. 2002, March 25. 2005. How to get there: In the summer one can drive the road connecting Gausdal valley with Fagernes in the Valdres valley. This road passes quite close to the National Park boundary, near Ormtjernsetra. The road is closed in winter, but one may start at the Verskei parking area where the road ends in the winter season. 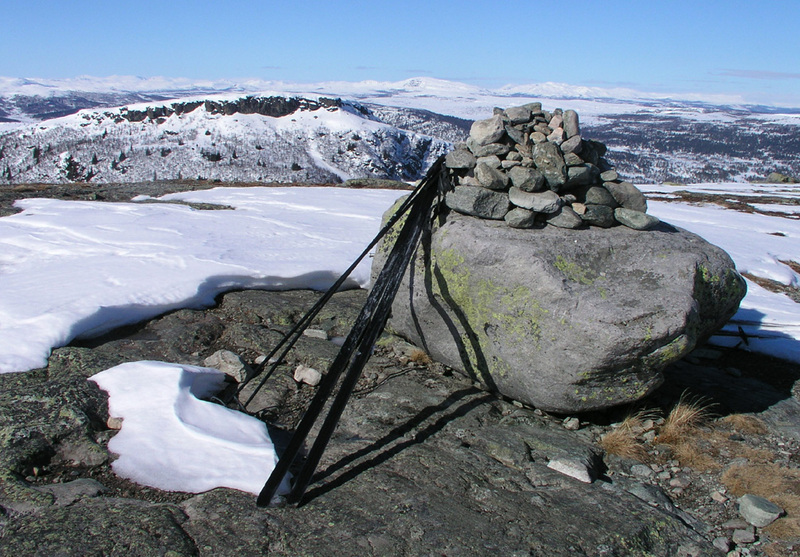 Route description: This description will only mention the ski ascent that we prefer. Ski passed the Ormtjernsetra and locate the small valley with a small creek coming down from the northern side. Follow the creek up to the saddle between Ormtjernkampen and the summit right to the north. From here climb the north facing slope which is free for trees and allows for easy skiing. The south and south-west slopes are steeper and more importantly, covered with dense forest that makes skiing much more complicated. Comments: The area around the base of the mountain is the smallest National Park in Norway. The spruce tree grows at a higher elevation here than anywhere else in Norway, well above 1000 meter. The area also seems to have more tracks of moose than elsewhere in these mountains. Rondane, as seen from the Ormtjernkampen summit. Snuen to Djuptjernkampen, a very nice mountain landscape across the valley to the west.